Each year, AIGA members develop and produce more than 1,000 local events through AIGA chapters across the country, including design lectures, portfolio reviews, networking sessions, competitions, exhibitions, and studio tours—see the events section for upcoming events near you! The annual AIGA Design Conference brings together an exciting mix of leading design thinkers and practitioners for three compelling days of talks, workshops, competitions, and more creative events in one of our vibrant chapter cities. Join us in Pasadena, California, April 4–6, 2019. Learn more. Call for entries: AIGA + Design Observer are pleased to announce the 50 Books | 50 Covers competition. This time-honored competition aims to identify the 50 best-designed books and book covers, with selections from the competition exemplifying the best current work in book and book cover design. Through events, webinars, workshops, certificate programs, and national conferences with strategic partners, educational institutions, and program sponsors, AIGA members have personal and professional development opportunities to learn new skills, get advice on pressing career questions, hear insights from industry leaders, build leadership capacity, and learn how to manage more effectively. Learn more. AIGA launched “INitiative” with The Creative Group in 2011 to help in-house designers and managers make a greater impact at their companies, evolve professionally and connect with a broader network of peers. Through articles, videos, events and a quarterly newsletter, this program provides information, advice, inspiration and insights to help in-house design teams thrive. Learn more. AIGA created Design for Good to build and sustain the implementation of design thinking for social change. As a movement to ignite, accelerate, and amplify design-driven social change, Design for Good creates opportunities for designers to build their practice, their network, and their visibility by supporting those who play a catalytic role in communities and create positive social impact. Learn more. AIGA’s new Diversity & Inclusion Initiative aims to encourage diversity in design education, discourse, and practice to expand the future strength and relevance of design in all areas of society. The initiative approaches the issue of diversity in design comprehensively, considering race, ethnicity, gender, sexual orientation, ability and disability, age, and other factors that may shape creative perspective and professional experience. Learn more. This new initiative develops AIGA’s commitment to empowering women designers and advancing the vital discourse on issues facing professional women today. The objective of this initiative is not to generalize or segregate women designers, but to recognize exemplary achievements and constructively address persistent biases and inequities. Learn more. Since 2000, Design for Democracy’s ballot and election design project has worked to make voting easier and more accurate for all U.S. citizens. Recent accomplishments include the “Field Guides To Ensuring Voter Intent” to help county election officials design and test ballots for usability, as well as the 2012 “Get Out the Vote” project to create nonpartisan posters and videos to inspire the American public to vote. Learn more. Originally conceived by AIGA, The Living Principles for Design distill the collective wisdom found in decades of sustainability theories and bring them to life in the first quadruple-bottom-line framework for sustainable design. They weave together environmental protection, social equity, economic health, and cultural vitality to create an actionable framework for sustainability—a common point of reference to which all designers can refer. Learn more. AIGA awards the AIGA Medal to individuals in recognition of their exceptional achievements, services, or other contributions to the field of design and visual communication, and AIGA chapters honor those who have contributed significantly to the practice of design, teaching, writing, or leadership of the profession with the AIGA Fellow Award. Similarly, the AIGA Design Archives are a repository of inspiring, award-winning work from AIGA’s design competitions. Learn more about AIGA awards. AIGA provides free public design resources such as the Symbol Signs, an international system of 50 symbols produced by AIGA and the U.S. Department of Transportation. Regular reporting on the design industry takes the form of articles and case studies on this site, as well as economic surveys including the annual AIGA | Aquent Survey of Design Salaries and the quarterly Design Leaders Confidence Index survey. In addition to outlining practical, legal and ethical standards for the communication design profession—including the AIGA position on spec work, a standard contract for design services, the Design Business and Ethics series, and the AIGA Standards of Professional Practice—AIGA is engaged in an extended design policy advocacy campaign to raise awareness of the value of effective information design in the public sector. Accessibility is a topic we as designers talk a lot about, when we’re making sure our digital products can be consumed by the widest range of people. But that same mindset can be applied to live events, as I discovered earlier this year. 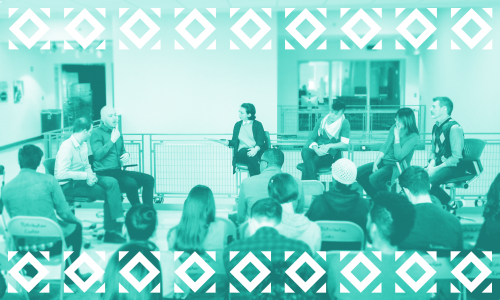 Earlier this year, AIGA DC planned an event called In Their Own Words: A Panel with Deaf Designers. Held at Gallaudet University, it brought together D/deaf designers Elise Roy, Yiqiao Wang, and Scott Carollo. As the profession’s oldest and largest professional membership organization for design—with more than 70 chapters and more than 25,000 members—we advance design as a professional craft, strategic advantage, and vital cultural force.